NEW YORK - Oct. 28, 2015 - PRLog -- REBELMANN will be a featured guest on The Jimmy Star Show live radio/tv show hosted by King of Cool Jimmy Star along with Cool Man About Town Ron Russell a to discuss their music, their career, and the entertainment industries at large. The Jimmy Star Show is tv/radio’s coolest hit show, featuring the coolest in music, entertainment, fashion and pop culture, all from a fun industry insider perspective in a completely live, unedited fast-paced two-hour conversational format. When you consider the number of young singers and musicians diving into the realms of pop and country music, the brothers of REBELMANN are living up to the band's name by bucking trends and pursuing careers in rock. The Chicago-based band consists of three brothers: Clayton Mann, 16, and twins Johnathon and Bryce Mann, 18. As winners of the "Chicago Music Awards Most Talented Teens 2012," the 3 REBELMANN brothers write, perform, and produce their own music. In doing so, REBELMANN was voted into The Recording Academy, which oversees the GRAMMY Awards, when they were only 13- and 16- years old. Their music is being validated by the industry, as REBELMANN made the 58th Grammy consideration ballot for rock song and rock performance; specifically, their latest single Indian Land is on the ballot. Although not written to make a political or social statement, Indian Land is bone-chilling, moving, and powerful in demonstrating the plight of the Native American. The lyric video is quite humbling. The Chicago-based band has already taken advantage of opportunities that would make some veteran bands envious; including opening for LA Guns on New Year's Eve at the popular Whisky-a-Go-Go on Sunset Strip; back-lining Gene Simmons at Rock Fantasy Camp; and jamming Music Row. It was apparent from an early age that Clayton, Bryce, and Johnathon Mann had their combined sights set on music, as all three boys played in their school's orchestra and still maintain professional lessons. “John is my twin, so we always did everything together when we were younger,” says Bryce. “John started taking drum lessons so I started taking drum lessons too. We can be competitive so I had to be better than him." While Johnathon has always been drawn to the guitar, becoming even more enthralled with the instrument when he started performing at recitals, Clayton tells a similar story. “I have always loved music. I remember being hooked on guitar after playing in a recital when I was ten. I knew I wanted to do it again and again. I wanted to take it bigger and to the next level even then," Clayton remembers. Even with such great opportunities presenting themselves for the band, all three members of REBELMANN have focused on using their music to help others. They were part of a recent Teen Nation Tour, which reaches out to youth all over the United States to deliver a strong message against bullying. Teen Nation shows saw REBELMANN performing in Texas, Michigan, Mississippi, Georgia, and more. The band is also expanding their brand reach deeper into entertainment. Having created music's newest Super Hero, REBELMANN has joined the likes of BatMan, SpiderMan, IronMan and SuperMan. The REBELMANN Super Hero is complete with the trademarked REBELMANN fringe and gold top guitar. Look for great things to come from this brand expansion! REBELMANN has their feet on their ground, but their eyes are definitely set to the stars. 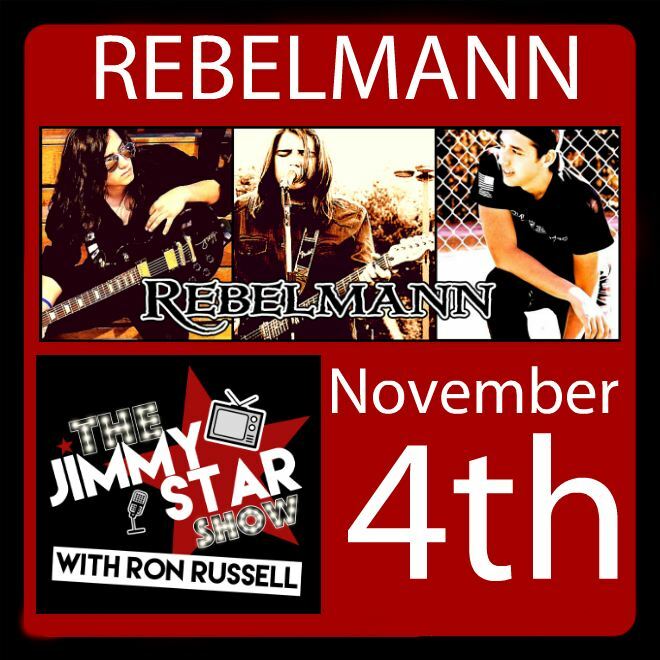 The Jimmy Star Show is pleased to showcase the expertise and talent of REBELMANN and all anticipate a fun and informative time talking with them about their career and the entertainment industries at large. Join King of Cool Jimmy Star, and Cool Man about Town Ron Russell as they have a playful and sometimes wild time with the talented featured guest! To hear REBELMANN live on The Jimmy Star Show tune in to W4CY Radio on Wednesday November 4th, 2015 from 3-5 pm ET and 12-2 pm PT online at www.w4cy.com from anywhere in the world.